I want to thank you for your faithful support. Over the years, Wheatland Memorial Healthcare has provided many of our neighbors, friends and family with quality healthcare. On behalf of Wheatland Memorial Healthcare, I would like to invite you to our annual fundraiser on August 25nd, 2018. 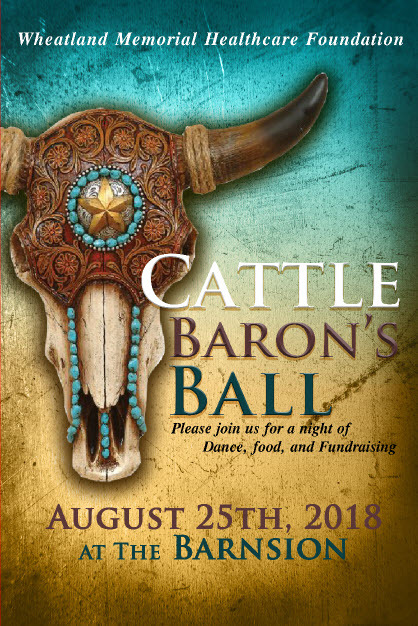 The theme chosen is “Cattle Baron’s Ball.” Please join us for dinner, dance and auction at the Barnsion. Tickets are $75 per ticket. This years’ gala will be in effort to purchase an ultrasound machine for direct patient care. An Ultrasound scan is a diagnostic imaging procedure that uses a combination of sound waves and computer technology to see inside the body. It is used to study parts of the body such as the liver, testicles, uterus and other organs. The exam is performed to look at the size of the organs and any abnormalities within them. Ultrasound can also be used to study blood vessels in organs as well as in the neck, arms and legs. I am asking you for your continued support by either a cash donation, donation for the silent auction or sponsorship. You may contact Jane Moe at 632-3176 for more information regarding auction items or donations. Please help us ensure the continued viability and growth of WMH for our community today and tomorrow. Tickets for the Cattle Baron’s Ball can be purchased at Wheatland Memorial Healthcare. You will receive an acknowledgement of you donation for IRS purposes.